Ever since Dexter was able to eat solid foods he has always loved yogurt. I have made it my mission not to feed him anything with HFCS (High Fructose Corn Syrup) or any other artificial sweeteners. My yogurt selection is very skimpy, to say the least. I was familiar with Stonyfield Farms because I devoured YoMommy yogurt while I was pregnant. It was so delicious. When I saw the YoBaby, I knew it would be perfect for Dexter. Boy was I right. There is definitely no HFCS in this organic yogurt, just all natural quality ingredients! The biggest factor though.....what did Dexter think? It was love at first bite. He has enjoyed the blueberry, peach, pear and apple yogurts for over a year now! YoBaby is all we buy. I was ecstatic to be able to review their yogurt. They sent me a couple of coupons for Dexter to try their yogurt and like I mentioned before---IT IS SO GOOD! I tried it myself and it is so creamy and dessert-like. You have to give it a quick stir because some of the milk fat settles on the top (and that in and of itself is reason enough to buy this awesome yogurt). Dexter usually has no problems finishing off one of these yogurts by himself. He usually wants to feed himself too and that is messy but fun! At Meijer, a six-pack of this yogurt sells for about $3.59. I think that is a tremendous bargain not only because it is nutritious but because it also gives you peace of mind that are you feeding your child quality, natural ingredients simply and easily. You can head over to Stonyfield Farms' website and print off some coupons to save you money. One lucky winner will receive 5 coupons each good for one FREE 6-pack of YoBaby yogurt. 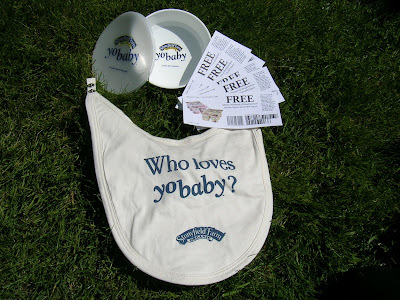 The winner will also receive a convenient bowl/lid and a baby bib. Check out the picture of the swag! I am mighty jealous! In a comment tell me who will enjoy all the free yogurt and which YoBaby flavor the baby would like best. Would you like extra entries? My son would enjoy these - apple is his fave! My son will enjoy the yogurt especially the banana flavored. Thanks for the chance. miss alanna would love some yogurt. she likes banana best. a friend in playgroup sent me to your site. It would be for my niece, Nadia. We like the blueberry/apple. My 19 month old, Jack, LOVES yogurt. I've never seen a kid eat yogurt the way he does. He will love the vanilla flavored. He's a boy of simple, classic taste. I'm a long time follower. Love your blog. My daughter loves yogurt! I think the Raspberry Pear is her favorite. I found you through Prizey.